Hello again everyone and a very Happy New year to all of you. I believe wishes are never late and I'm back to blogging after almost a month as I had taken a break and had traveled to India for vacations with my parents. Being with parents gives everyone an immense pleasure, no matter how old we are. It was very special for me and I enjoyed my trip to the fullest. It was so amazing to leave behind the cold, snowy weather to bask in the sunshine. My stay was full of shopping, sunshine, family love and food. Food, yes food is one of the most special part whenever I visit India: there are so many things I crave to eat all year long and I get overwhelmed by the choices I get to eat in my beautiful country. From roadside chaats, pani puri, samosas and kachoris, stuffed parathas and all types of curries and the typical sweets; you name it and you get it. While it gives immense pleasure to sit and eat in the sunshine, it gives more pleasure to cook something for your parents and family. So I did prepare Whole wheat Samosas , Stuffed karela and Dal-Pakwaan at home for my family. 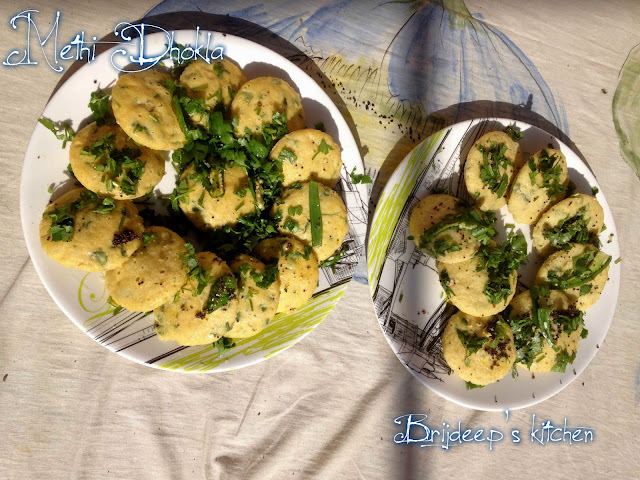 Everyone also wanted me to prepare the instant dhoklas they have been looking at my blog and wanting to try at home since long. Winters in India are beautiful: it's little cold with plenty of sunshine on most of the days, and you get the abundance of vegetables in the season. It was almost raining green leafy vegetables: mint, coriander, mustard, methi, spinach, bathua and what not.. 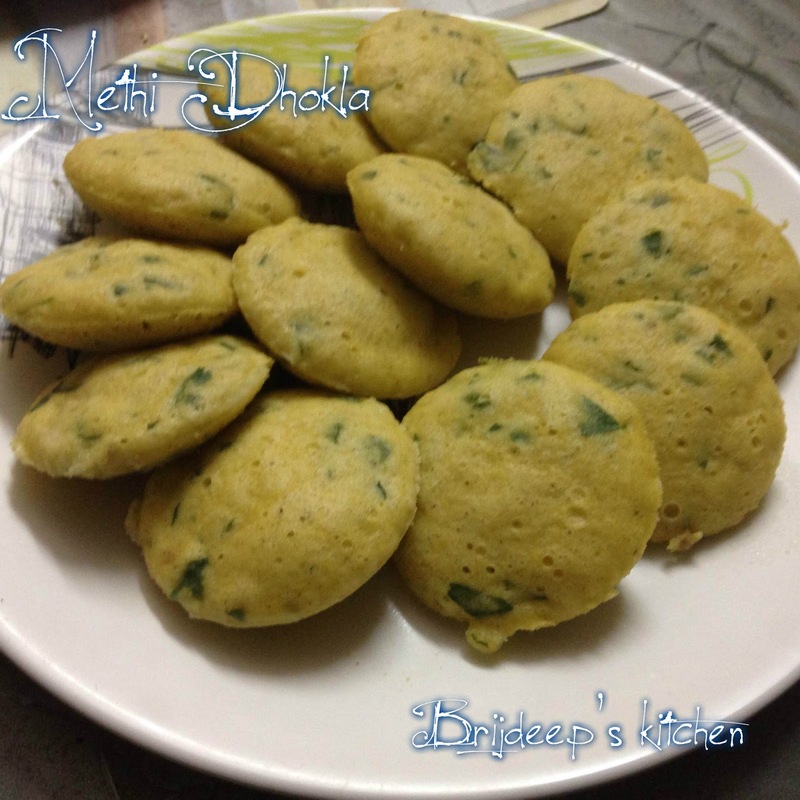 So I decided to experiment a bit and filled in my dhoklas with abundant methi leaves. Also my mother doesn't use a microwave so I had prepared these on the regular stove top in idli molds. It took a total of 5 minutes for each batch. I had prepared a lot of batter and steamed them in 3 batches for my whole family. First we begin by making the batter. Take a big size bowl and and the chickpea flour and semolina. Add salt, 3 tsp. sugar and lemon juice. Wash and chop the methi leaves very finely. Add to the bowl. Mix all the contents of the bowl lightly. Begin adding little water and mixing the flour to make a batter so that no lumps remain. Keep adding water slowly until the batter reaches the consistency where it's not too thick and it shouldn't be too liquid. Add the ginger and green chilli and mix everything well. Cover and leave for about 30 minutes. Add the Eno fruit salt after 30 minutes and sprinkle little water over the fruit salt. It will begin to bubble up and that's when mix it nicely with the whole of the batter. Do not mix vigorously. Now the batter is ready to be filled in molds and steamed. Add water in the idli cooker and begin to boil the water on high flame. Cover it without the pressure. Grease the idli mold (or the dhokla molds) and fill in the batter.By this time, the water will be boiled. Remove the cover and keep the mold inside the cooker and cover again (without pressure). Turn off the flame after 5 minutes, remove the mold and check if done with a toothpick. Gently remove all the molds from the cooker and keep aside. After 5 minutes, slowly remove the dhoklas from the molds in a big tray or plate. Steam all the dhoklas in this manner. Now we begin to prepare the tempering. Heat the oil and crackle the mustard seeds. Add the slit green chillis and fry on medium flame till they start turning white. Add 2 cups of water and mix well. Add the sugar, mix and bring it to a rolling boil. Turn off the flame and spread all the tempering over the steamed dhoklas. Let sit for a minute so the dhoklas soak in the water. 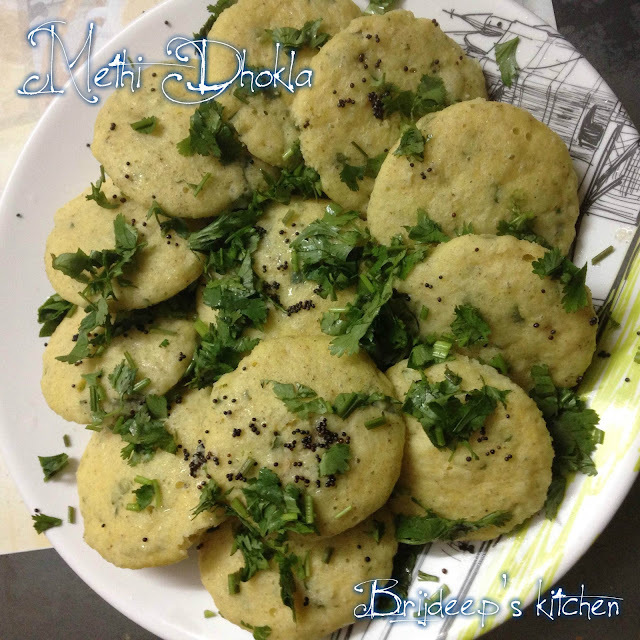 Now remove dhoklas one by one and arrange on another tray or plate because dhoklas will absorb water in a minute and the excess water would be left behind. Garnish with coriander leaves and serve with mint-coriander chutney. They taste awesome if refrigerated for about an hour before serving. 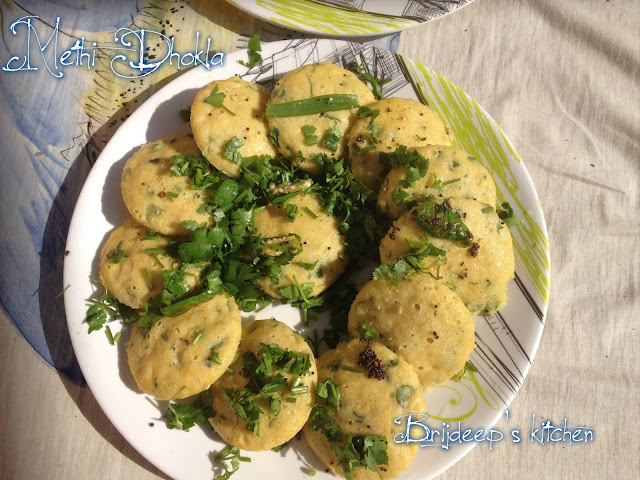 These dhoklas can also be prepared in the microwave in 3 minutes by following the same recipe: instead of steaming on stove top, just microwave for 3 minutes on the highest power. Loved this post? Please do leave a comment/feedback and don't forget to join my Facebook Page and subscribe to latest updates from the blog.